Video FX & Chain Asset Inspector, inspecting the 'City Lights.qtz' asset. VDMX supports several different FX protocols- ISF, CoreImage, Quartz Composer, FreeFrame, and FreeFrame GL. As a result of this, the default VDMX installation on a new mac has immediate access to over a hundred different image filters, and several hundred more are available for download from a wide variety of different sources (to say nothing of your ability to quickly and easily create your own FX and composition modes, particularly with Quartz Composer). Video FX & Chain Assets are how you organize, retrieve, and save the settings for all of these FX. Every filter/effect VDMX supports has a corresponding asset in VDMX which stores the default settings for the FX- both the properties of the FX-specific UI items as well as the standard wet/dry slider and composition mode. In addition to these default assets, you can create new assets with one or more FX in them, with all the custom settings you’d expect (FX chains). The “Use Source” pop-up button contains a list of video sources available to VDMX (this is the same pop-up button found in layer source windows). This lets you choose a video source used to preview the inspected asset- you can see exactly how FX and FX chain assets will look when you apply them to various layers or other video streams. The Composition Mode Asset Inspector has two “Use Source” pop-up buttons- one selects a video stream for the top image, the other for the bottom image. The “Opacity test slider” in the Composition Mode Asset Inspector (not pictured) lets you preview what the composition mode looks like as it’s faded in and out- this is particularly useful for previewing animations or transitions in composition modes created via Quartz Composer. 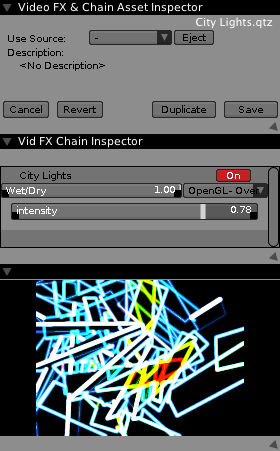 If the inspected asset is a video effect or FX chain, the inspector for the actual FX appears immediately below the asset inspector- this is where the UI for the FX is displayed. If the inspected asset describes a single effect, the corresponding effect can’t be deleted from the asset (nor can the asset be deleted). Use the “Duplicate” button to make a copy- or just make a new chain via the toolbar under the table view in the Workspace Inspector- then customize the new chain as much as you want. Below the Vid FX Chain Inspector is a preview of what the inspected asset would look like if images from the chosen source are run through it. Because this is an inspector, it’s only running at about 10fps.